Manage all your projects with easy-to-use mobile technology and expert professional services to reduce rework, overtime, and cost overruns. Every day, your crew is under pressure to be productive and efficient, always trying to do more with less. When work halts because they don't have the current set or the right materials, you lose more than just a couple of hours. Project management platforms and mobile apps aren't new, but for many in the construction industry, the clunky interfaces, storage and collaboration limitations, and cumbersome software requirements of first-generation technology offerings have made them apprehensive about adopting modern AEC project apps. They're not anti-technology, but they are anti-wasting time. To your construction teams, time is their most perishable resource and wasting it goes against their principles. When you give them intuitive, user-friendly technology and tools that help ensure they stay on schedule and budget, they won't just use them; they'll embrace them. ARC's SKYSITE Projects is a centralized mobile hub that puts real-time data at your whole teams' fingertips from bid to closeout, creating an unequivocally collaborative setting to get your entire team talking anytime, from anywhere. When everyone has access to the documents they need where and when they need them, changes go from undetected to understood and projects stay on schedule and budget. from SKYSITE by clicking below. 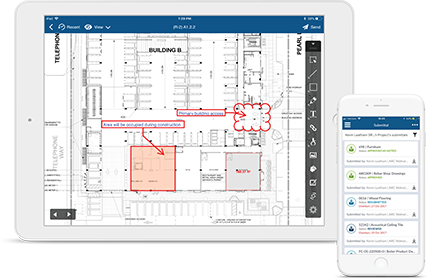 Our mobile construction app is a single-source, cloud-based file sharing and project collaboration tool built with best-in-class technology that guarantees your team is always working from the latest set. ARC's SKYSITE Projects has significant advantages over other construction drawing management applications. Since Projects updates by revision date, you can rest assured your team is working from the current set. And when you’re ready for closeout, all tags and links are maintained for easy export. Oh, and did we mention unlimited storage? Projects lets you build without the limits of paywalls or drawing caps. With ONE CLICK you can share the latest files, blueprints, photos, and bid packages with your entire team in real-time. An easy-to-use mobile solution that provides your team with the most current project information–anytime, anywhere. Our mobile project management app is the straightforward, reliable, go-anywhere solution that adapts to the way you and your team work best. 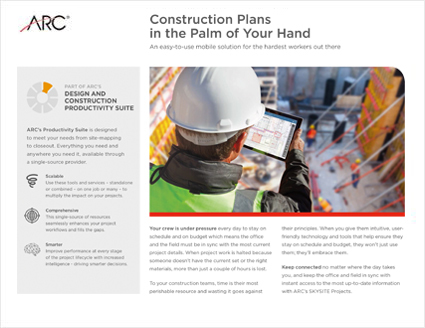 Unlike other construction management applications that limit your storage and put paywalls between you and your next steps, ARC's SKYSITE Projects works hard to make your job easier so you can complete projects on-time and on-budget. Never build from outdated plans again: Our flexible solution supports the most commonly used file types so you don’t waste time converting files before you can use them, and we’ve built in tools to make it easy to mark up, link, and share drawings in an instant, with document version control and auto-sync capability to ensure your whole team is working from the latest set. Not just a construction app: Create optimized, responsive workflows with our single, cloud-based solution that puts all of your drawings, photos, submittals, RFIs, punch lists, and project emails in one place. Tag, organize, and link all of your documents with customizable organizational tools so you can index your documents in one easy-to-search location, so you have what you need when you need it. One click collaboration: Our practical and straightforward app design makes it easy to get your whole team on the same page while keeping you in control. Assign access and permission levels to allow collaborators to make decisions in real time, marking up documents with text and drawings, sharing photos, or granting approvals in seconds, so every member of your project team is just a tap away from the critical information they need to get the job done. You don't sit in the office all day. Keep connected no matter where the day takes you, and keep the office and field in sync with instant access to the most up to date information. ARC Projects is a single, cloud-based solution to digitize, index, and hyperlink all of your construction documents. 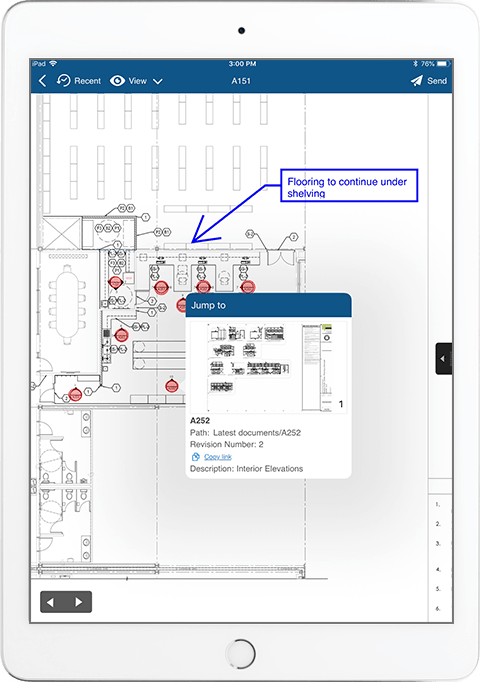 View, markup, and share documents with your entire team in real time; respond to RFIs; approve submittals, and manage punch lists from your smartphone or tablet to keep your projects on schedule and avoid rework and overtime. ARC understands the way you work, and we built our app with you in mind, taking a ground-up approach to constructing an uncomplicated, adaptable user interface that is easy for your whole team to adopt. Upload, markup, compare, annotate, and approve drawings with ease; manage and track RFIs, punch lists, and submittals; and oversee all of your projects from a home base that goes where you go and is available on and offline. Avoid costly delays and rework with up-to-date information shared across your entire team of owners, architects and contractors. Custom-built for the way you work, our mobile platform gives your team access to up-to-the-second information anytime, from any device. No internet? No problem. Changes will sync as soon as you reconnect. Never wait for WIFI again with anywhere connectivity that lets you work where and when you need to, even if you’re offline, without having to worry about additional steps to get updates to the rest of your team. As soon as you’re connected again, ARC's SKYSITE Projects automatically syncs your entire team up with you and ensures that they’re working with the latest information. Even the most non-technical team members will ramp up quickly thanks to our simple and intuitive app design, empowering them to work smarter and increase productivity. How much time can you really be saving if your construction management software takes your entire time out of the field and puts them into a classroom so they can learn a complicated new system? If your technology isn’t working for you, it’s probably working against you. You have enough on your plate already without having to worry about installing new software, downtime for updates, and lengthy training and support sessions. 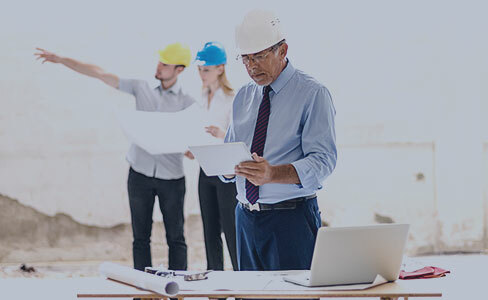 ARC Projects was developed by a team of industry experts to offer you the solutions you really need to streamline your projects from concept to closeout to win more jobs, reduce rework and overtime, and avoid cost overruns. Eliminate the costly mistakes associated with outdated project information. With real-time sync tools, everyone is always on the same page. Nobody on your team wants to deal with errors or rework, even though the industry has become resigned to accepting it. According to the Q4 2017 USG & CCI Commercial Construction Index, a mere 11% of contractors consider jobsites to be very efficient, with 29% citing jobsite logistics, such as materials management and communications networks, as a top issue impacting efficiency. In an industry of increasingly complex projects and shrinking profit margins, productivity is crucial; it is also, lamentably, declining in certain markets. More than 50% of rework is attributable to miscommunication, document control deficiencies, and insufficient project data. Industry professionals who refuse to accept inefficiencies as par for the course remain ahead of the curve by embracing technology and making it an integral part of their workflow, reducing rework and significantly improving profit margins. Learn about our commitment to standards which ensure your data is always safe. You want your documents and data to be available when and where you need them, but that doesn't mean you want to compromise on data security. With ARC, you don't have to: our company, and cloud-based platform have achieved ISO/IEC 27001:2013 certification, reflecting our commitment to securing and protecting your data against threats and vulnerabilities. We keep your documents and data secure without creating hurdles for the authorized users who need to access them. Our information security system complies with international best practices and includes a rigorous set of standards to keep all of the data hosted with us secure. Everyone from the general contractor to the architect is very happy with it. They love how easy it is to scroll through drawings, view the whole plan or click on links to zero in on specific details.